The child was born in February 2008. At the time, Libin and his wife, Diana, were residing in Israel. Diana died shortly after childbirth. Libin and the wife’s parents entered into an agreement in Nassau County wherein the wife’s parents, Katerina and Alexander Berkovitch, were given temporary custody of the child. 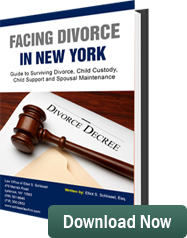 Libin thereafter brought a proceeding in Nassau County and asked for sole custody and requested the prior stipulation with the grandparents be nullified. The child lived for three years with Libin’s parents on Long Island. The paternal grandparents visited regularly. In 2011, the maternal grandparents found out Libin had taken the child to Israel. At that time, Libin sought to have the jurisdiction over this proceeding transferred from the Supreme Court in Nassau County to courts in Israel. The court’s decision stated even though Libin planned on living in Israel, the signing of the stipulation giving jurisdiction to the New York State Court was still valid. This is a case where the grandparents’ rights were upheld.